The perfect weeknight dinner recipe – keto chicken enchilada soup! It’s not only low carb, but super creamy and easy to make, too. What I loved most about this, though… was how easy it was! I basically through it all in a pot and let it cook. I don’t like anything too complicated so this was PERFECT!! Just be sure to scroll down below for the full recipe. Chicken is very keto friendly – it’s a great source of protein and goes along great with meals high in fat, too. If you’re looking for keto-friendly options, chicken is a fantastic staple to use in your meals! How many carbs are in chicken? There are actually NO carbs in chicken!! This is what makes it very keto-friendly… you can almost eat as much as you want of this stuff. As long as it’s not coated in carbs such as white flour or breadcrumbs (but there’s keto-friendly alternatives to those too), there are no carbs and a great keto-friendly protein option! 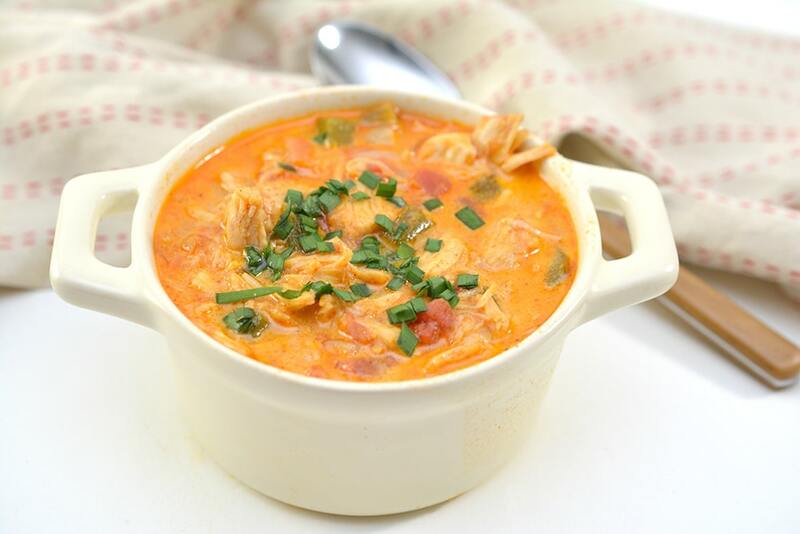 Before you get started, gather up all the ingredients you need for this delicious keto chicken enchilada soup! Especially with so many ingredients, it makes it TONS easier to get them gathered and measured beforehand. To get started, heat up the olive oil in a large pot over medium-high heat. Then, add in the onions and peppers and saute them for 2-3 minutes until they are crisp and tender. Next, toss in the garlic powder, cumin, chili powder, and paprika; stir into the vegetables for about 30 seconds until they become fragrant. Whisk in the chicken bone broth and then stir until well combined. 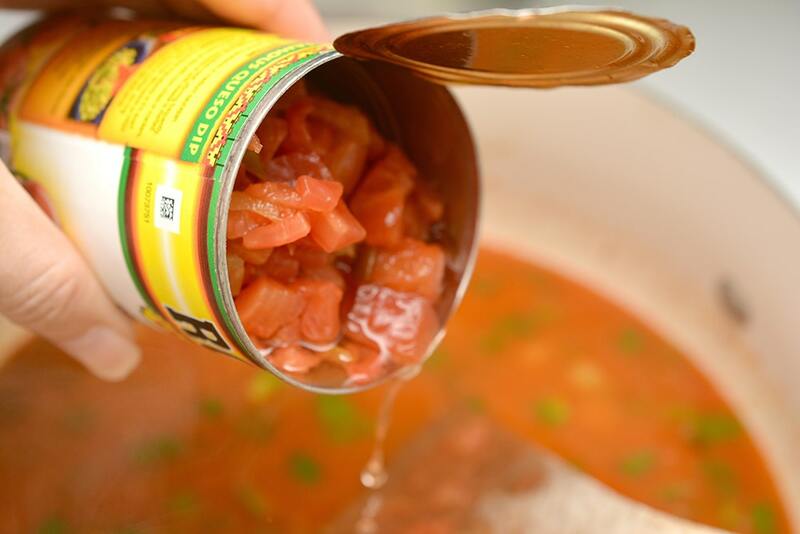 Reduce the heat to medium and add in the low carb salsa and rotel. Next, stir in shredded cheddar cheese until completely melted and then let the soup simmer for about 10 minutes, stirring occasionally. 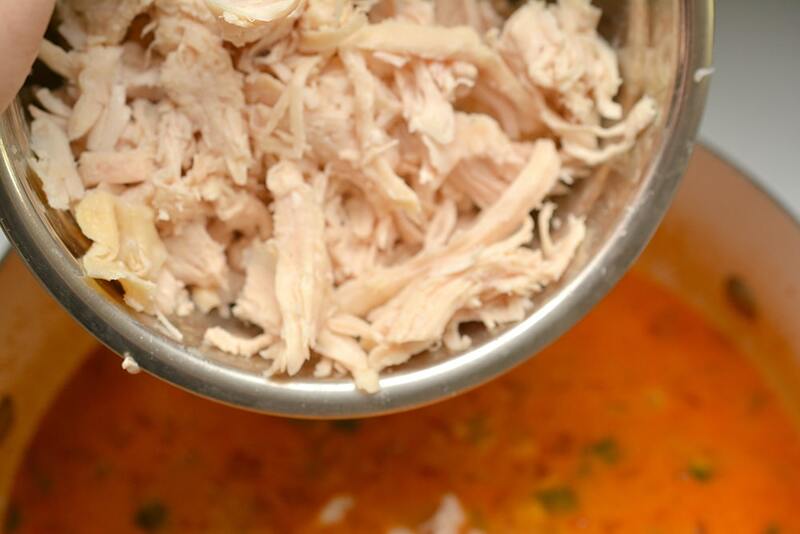 Once you’ve done that, add the shredded chicken until well combined. Then, add salt and pepper to taste and simmer for another 10 minutes. Next, stir in heavy whipping cream and cook for an additional 1-2 minutes and then serve with fresh herbs as garnish. Enjoy! 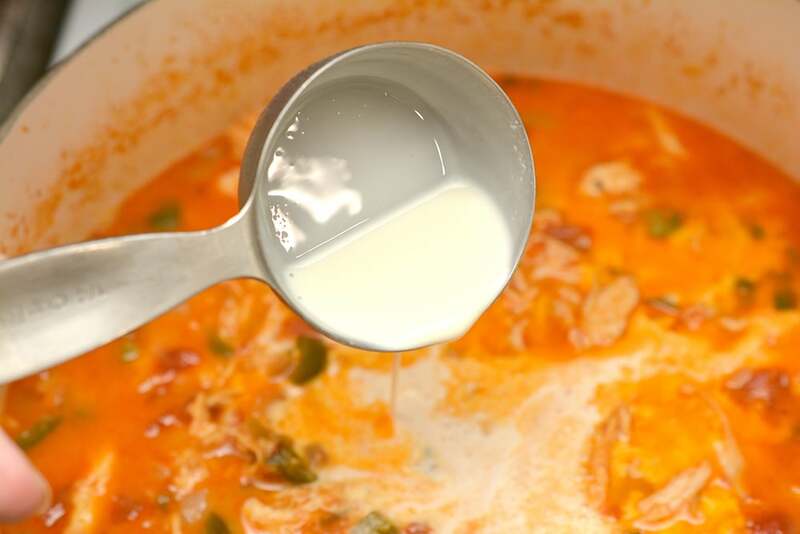 If you’re ready to make your own easy and delicious keto chicken enchilada soup, just follow the recipe below! 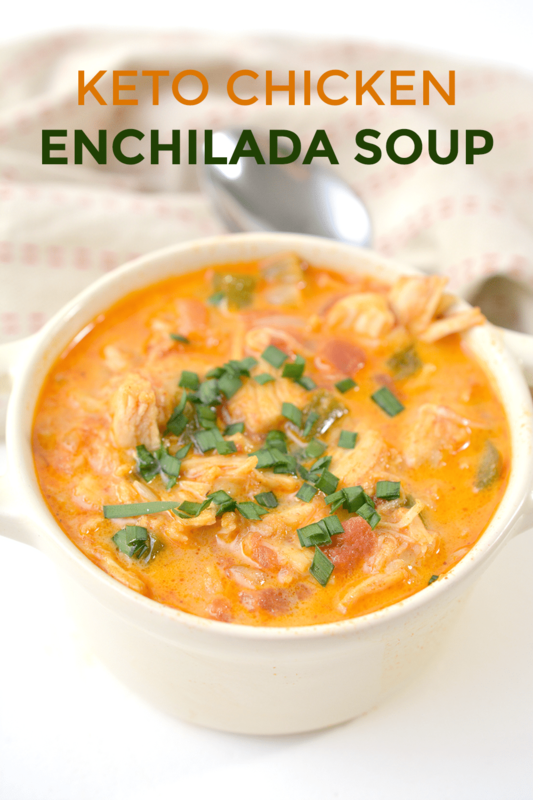 The perfect weeknight dinner recipe - keto chicken enchilada soup! It’s not only low carb, but super creamy and easy to make, too. Heat up olive oil in a large pot over medium-high heat. 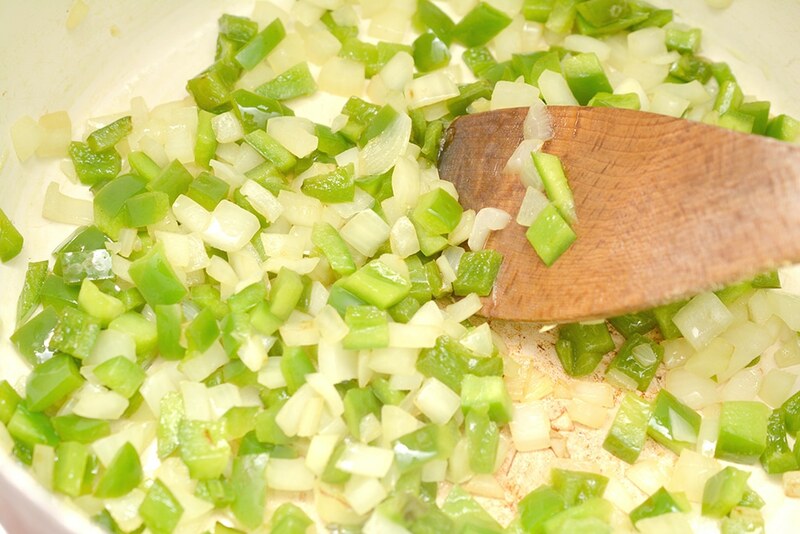 Add onions and bell pepper and saute for 2-3 minutes, until crisp and tender. 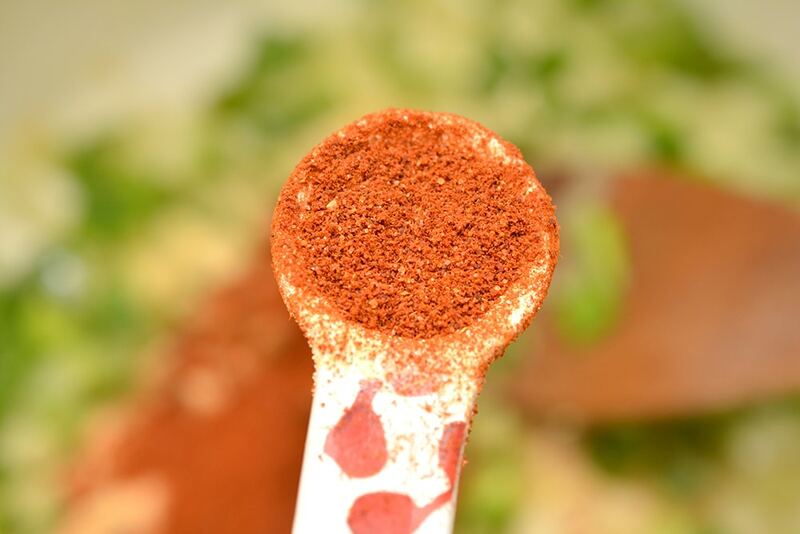 Add garlic powder, cumin, chili powder, and paprika; stir for 30 seconds until fragrant. Whisk in chicken bone broth and stir until well combined. Reduce heat to medium and add in low carb salsa and rotel. 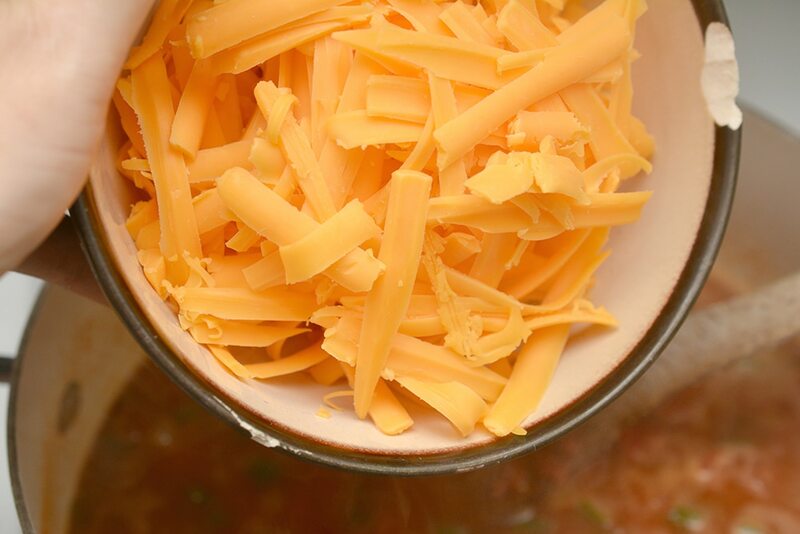 Next, stir in shredded cheddar cheese until melted and then simmer for about 10 minutes, stirring occasionally. Add shredded chicken until well combined. Then, add salt and pepper to taste and simmer for another 10 minutes. Stir in heavy whipping cream and cook for 1-2 minutes and serve with fresh herbs as garnish. Enjoy! 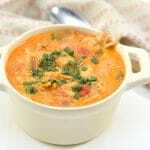 Your Keto Chicken Enchilada Soup looks amazing! Hope you have a great Valentine Week and thanks so much for sharing with us at Full Plate Thursday! That sounds delicious! Thanks for sharing at To Grandma’s House We Go DIY, Crafts, Recipes and More Link Party. I pinned this! Hope to have you join again next week. Have a great day! Thank you, this recipe was fabulous, loved it! My husband is doing Keto and was just talking about soup recipes. Pinning this to make for him! It looks awesome! Thanks for being a part of Merry Monday!